Honor a special aunt and her important place in your life with one of the Russell Rhodes exclusive friends & family ornaments. 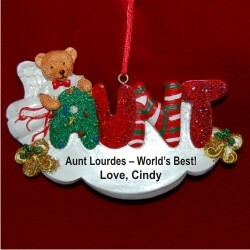 The aunt personalized Christmas ornament will be one she'll always cherish we she sees the custom message you've chosen for it. We'll add it by hand beneath the vibrant, gleaming hand-carved letters accented with glitter and seasonal highlights. This aunt Christmas ornament personalized for her makes a lovely gift with our included sateen display ribbon and exclusive velvet drawstring pouch.